The world's tallest building Burj Khalifa has clinched its newest Guinness World Records title for being the highest man-made vantage point on earth. 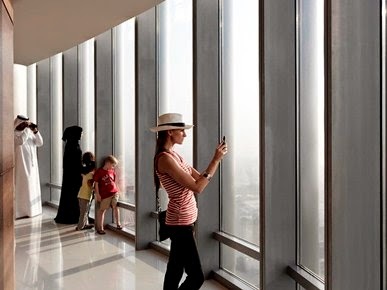 For the first time, Emaar Properties, the developer of Burj Khalifa, yesterday opened the doors for the public to soak up unmatched views of the Dubai city from the all-new 'At the Top, Burj Khalifa SKY'. Burj Khalifa is the world’s tallest free-standing structure at 828 metres (830 metres to the tip). The new public observation deck stands at a height of 555 metres. This sets a new record above the Canton Tower in Guangzhou, whose observation deck stands at a height of 488 metres. The new record was confirmed by officials of the Guinness Book of World Records at the launch of the new deck, called "At The Top, Burj Khalifa Sky". The new honor adds to Burj Khalifa's three existing Guinness World Records titles for the Tallest Building, the Tallest Man-made Structure on Land and the Highest Restaurant from Ground Level. Talal Omar, Country Manager for the Middle East and North Africa for Guinness World Record, said, "Burj Khalifa has done it again, surprising the world with its iconic scale and the ongoing creative enhancements. The new Guinness World Records title is another feather in the cap for Dubai."